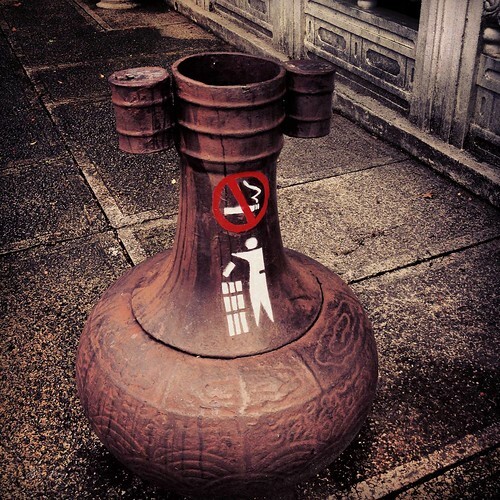 On our third day in Taiwan (second full day) I was sick with either a stomach bug or food poisoning. It was terrible. 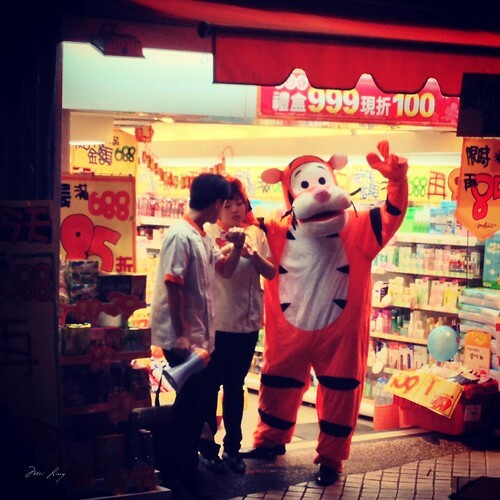 Because of that I couldn’t leave the hotel and Dan was forced to wander around Taipei by himself looking for food. 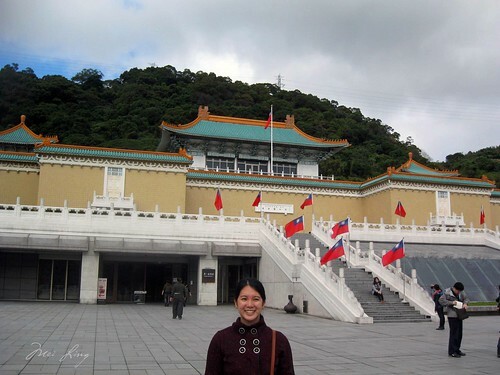 The outside of the National Palace Museum. After a very unpleasant day in the hotel, I was ready to venture out the next morning. 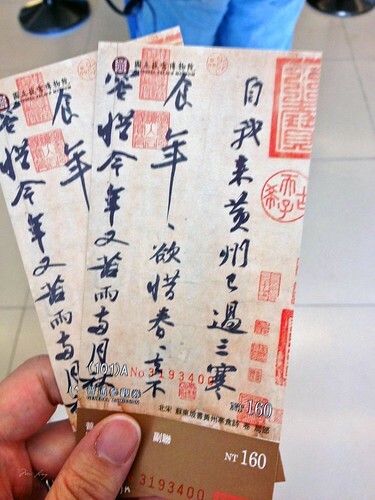 We had originally hoped to go to Pingxi to do the sky lanterns (especially since it was such a beautiful day). 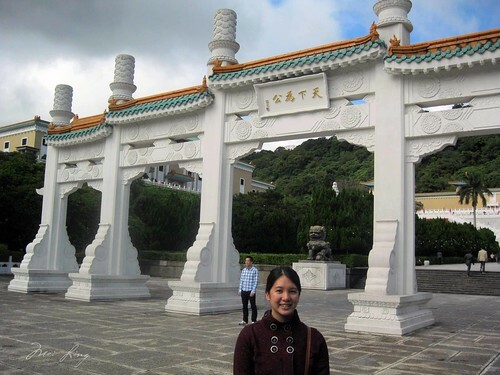 Unfortunately, because my stomach was still pretty delicate we decided to visit the National Palace Museum instead, where there would be plenty of opportunity to sit and rest as well as access to washrooms at any time. Dan and I on the bus. To the left is the bus schedule. 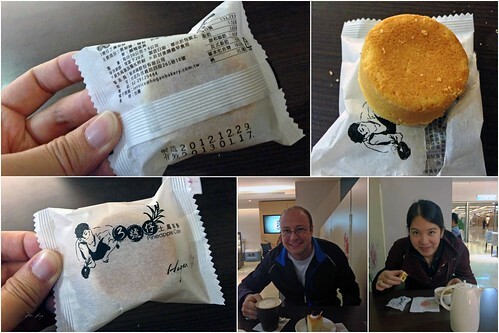 We had a light breakfast at Taipei Main Station (Chinese buns) and then took the MRT to Shilin Station. From there we took a bus to the Museum. I’m not sure how we figured out how to find the bus that we needed to take, since everything was in Chinese, but we managed to figure it out. There’s no photography allowed in the museum so we took a bunch of pictures outside. 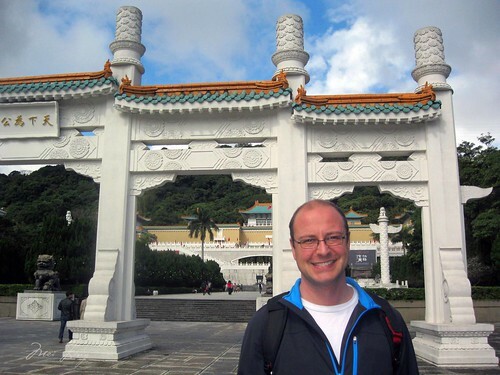 Dan outside the National Palace Museum. 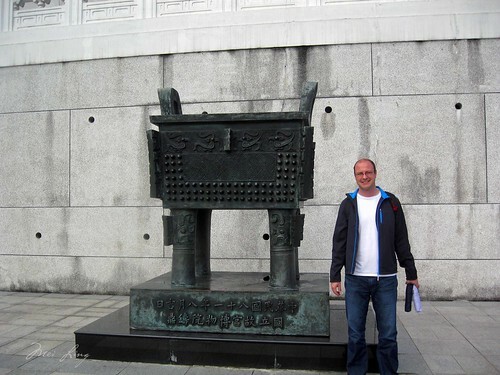 Me outside the National Palace Museum. A garbage can. My dad took the same picture when he was here! Dan and I outside the museum. Selfie! Even though it was incredibly busy, we still managed to make our way through the exhibitions and see everything that we wanted to see. There were crowds of tour groups from mainland China and Japan, so we had to wait for a while before we could see the famed Jade Cabbage. When I was looking at a piece near it someone from mainland China walked into me and I almost fell over. It was kind of comical. We soon learned to push and shove so that we could see everything that we wanted to see (it helps to be taller than everyone around you!). I was really impressed by the Jade Cabbage and there was also a piece of jade that looked like a piece of meat. 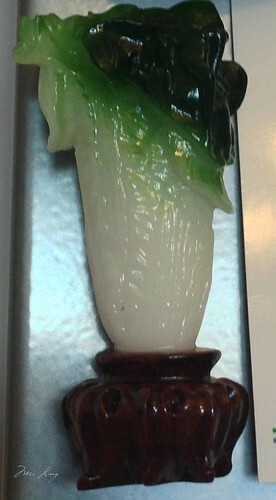 I don’t have a picture of the real thing, but here’s a picture of our replica Jade Cabbage (this is a magnet). We were able to enjoy some of the pieces peacefully when we went to the less popular exhibitions where there were only a few tour groups (not crowds of them all fighting to see and to hear their tour guides). 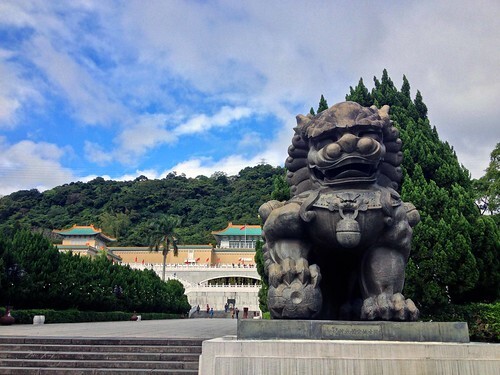 The National Palace Museum houses some really beautiful pieces and is a must see for anybody interested in art and culture in Taiwan. 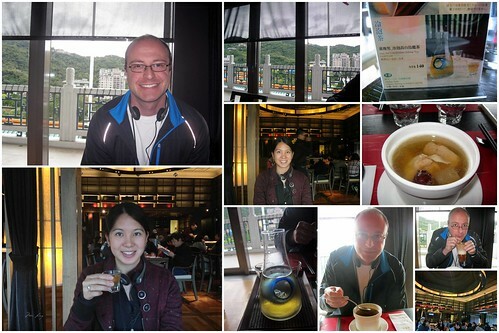 At lunch time we decided to stay in the museum and took the elevator up to the tea house on the top floor. I had a chicken soup since my stomach was still pretty sensitive and I also had some ali shan tea, served cold. It was refreshing. 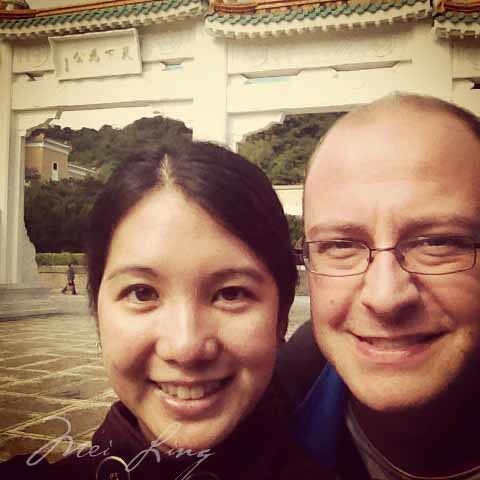 Dan and I had lunch in the tea house at the top of the National Palace Museum. I had iced ali shan tea, which was refreshing and delicious. I also had chicken soup. I can’t remember what Dan had. After lunch we went back down to the museum and finished looking at everything that we wanted to see. We spent the entire day there. Before leaving we made sure to pick up a jade cabbage of our own (in magnet form) and a few other souvenirs. We also stopped for a snack in the cafeteria. I had a pineapple cake, which is a Taiwan speciality. Enjoying my pineapple cake snack while Dan enjoyed his cake. 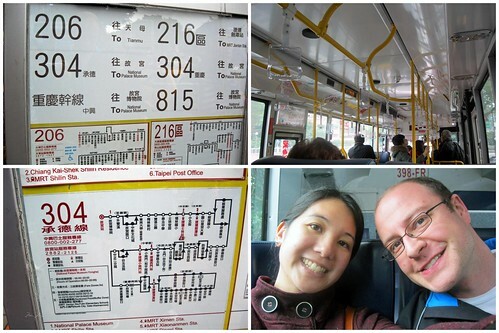 When we finished, we took the bus back to Shilin Station. Once again, we skipped the night market and called it a night. Though I did get a picture of a nice Tiger mascot outside of a store. This tiger mascot posed for a picture.